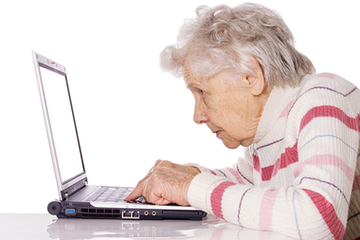 There’s no doubt about it: finding good stock photography can be tough. And when it isn’t tough, it’s expensive. When I scroll through images on the popular stock house websites looking for images for our blog posts or newsletters and see how much they’re charging for their stuffy, posed, man-in-suit photos I am always aghast. And annoyed. Very, very annoyed. Thankfully, I’ve come across a few great stock photography websites recently that are completely free. While we still use many of the resources that Andi shared a few years back, the sites below have become my new go-tos. Most, if not all, of these sites are full of royalty and attribution-free photography, meaning you can use, copy, modify, and distribute these photos without the permission of, or reference to, the photographer. Yes, even for commercial use! Pexels – Built to help designers, bloggers, and just about everyone else find high-quality, free images, Pexels is one of our absolute favorites. They recently launched a free stock video collection as well. Unsplash – Started as a Tumblr blog where a photographer shared 10 photographs that were leftover from a photo shoot, Unsplash has grown to a collection of over 300,000 photos contributed from over 50,000 photographers. They are all simply stunning (and all free)! Burst – Powered by Shopify, this free stock site was built to “empower designers, developers, bloggers and entrepreneurs to create stunning websites and marketing campaigns.” There are thousands of stunning stock photos, ripe for the choosing! 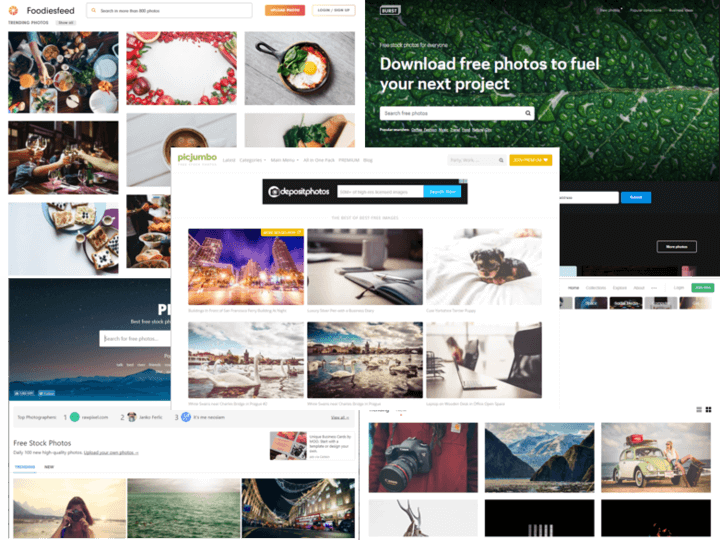 Pic Jumbo – When the large stock houses turned down freelance photographer Viktor Hanacek’s photos, he decided to use his coding skills to start his own free stock website. Almost all of the images were shot by him, and while he always welcomes attribution, it’s not required. The only thing you can’t do is redistribute the photos, but if you’d like to, there’s a paid plan available for that purpose. Foodiesfeed – While this stock site may only be of interest to a limited audience, there are lots of high-res and drool-worthy free food photos on this site. Remember that over time licensing agreements on these sites may change, so be sure to always, always read the fine print and abide by the rules! Have you found any other great royalty-free stock photography websites? Please share! basis not just to connect with my friends, but to see what is going on in the world and to see what is trending from a business and marketing standpoint. I’m also learning a lot about how to use social media to connect with your clients and constituents so they can better connect with you. I recently attended a digital writing class hosted by Carrie Hane, Principal of Tanzen Consulting, where I learned about everything from creating better emails to writing for SEO. The topic I found most interesting, though, was writing for social media, since I use it on a daily basis and it’s something you don’t learn a lot about in college or in school in general. Always put your audience first – what are they interested in? What content can you share to best meet their needs? Aim to be shareable. More shares = more likes = more interest = more business! Keep in mind that your social channels and each post are part of a much bigger story. Think about how you can differentiate your content – there is a lot of noise on social media, so what can you do to stand out in the crowd? The ideal tweet shouldn’t exceed 100 characters and needs to be more than 70. Share 4 to 5 relevant pieces of content that are not your everyday, such as blog pages, articles, or retweets of a relevant quote. Make sure you are following your customers back! Share business news and current topics that are happening in the industry. Always try and include pictures with your posts – you will get more engagement from your audience. Facebook allows unlimited text in your posts, but the ideal length for a post is above 40 characters but less than 120. Use great pictures or short videos to get a lot of traffic. Try to keep posts to under 150 characters, and keep in mind that only the first 140 characters will display before they get cut off and users have to click “more” to see the rest. And one more piece of advice for all platforms: regularly update your profile picture and cover photo; it’ll keep your audience more engaged with your page. I had a great time attending Carrie’s workshop, and as you can see I learned a ton! If you’re interested in hearing more from Carrie on writing for the web, make sure to check out the Matrix Minute video that CEO Joanna Pineda recorded with her about How Writing for Digital is Different. 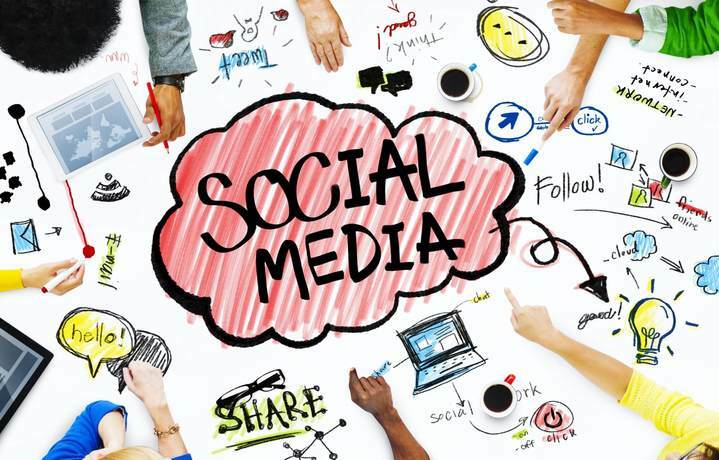 What other tips do you have for using social media for business? I’m all ears! While 2016 was an exciting year for design – there was a shift toward mobile-first design, video and rich imagery were hotter than ever, and animations became the norm – I’m even more excited about what we can expect to see in 2017. A few weeks ago, Creative Director Alex Pineda and I held a webinar with CEO Joanna Pineda to talk about the trends that are emerging in 2017, and how you can give your members the best user experience possible by incorporating them into your web presence. Whether your plans for 2017 include a large-scale website redesign, building a brand new website from scratch, launching an app, or simply refreshing a few of your key pages, we’d love to help you incorporate some of these trends! Which design trends are you most excited about for 2017?